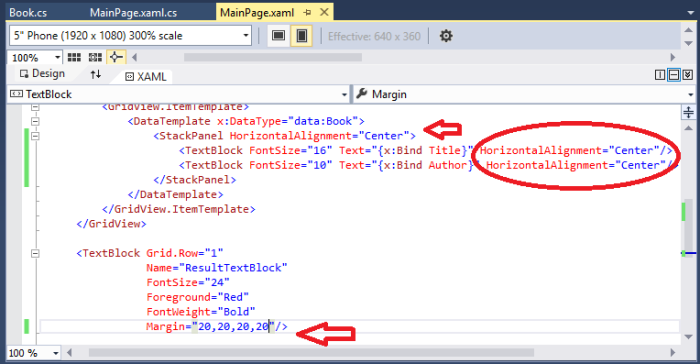 In this article you will learn Data Binding to GridView Controls. Data Binding is the process of taking some data and associating it to visual elements on user interface (UI). Data Binding is the process of taking some data and associating it to visual elements on user interface (UI). We will take any object and with their properties present each instance of object in collection on screen to user in “Grid “like fashion. We get to create a little template of how each individual instance of object is represented in the user interface .The “ListView” is also same but it works in single column fashion. Select “Universal” as shown by arrow. 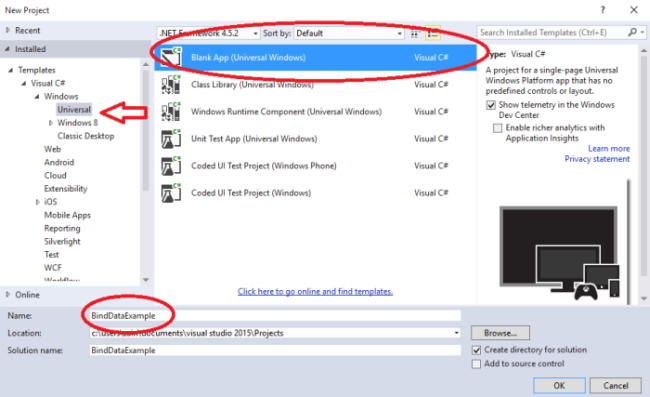 Select “Blank App” as shown in circle. Name your solution, for instance “BindDataExample“. 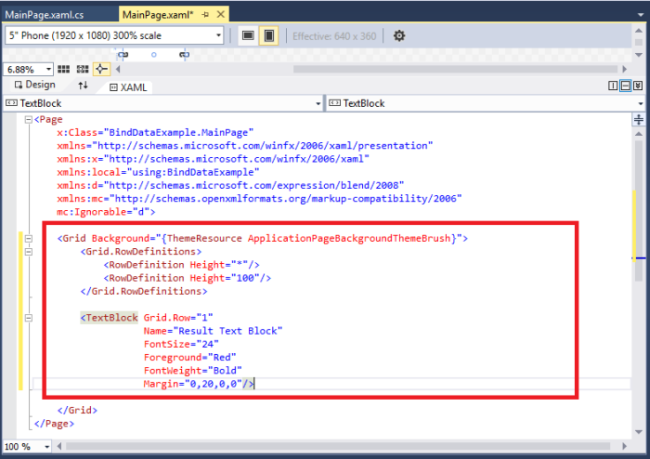 A designer window will open once you create the project with name”MainPage.xaml“. 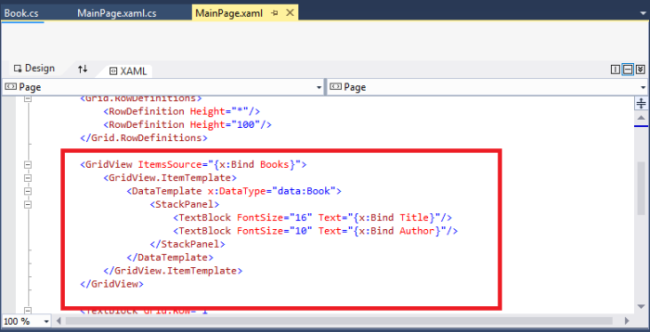 in this window there is a designer surface and you can also write your XAML code …now for instance we select our object a “Book” and in order to perform data binding simply create a user interface in XAML . The code is shown in the following image in rectangle sharpe. 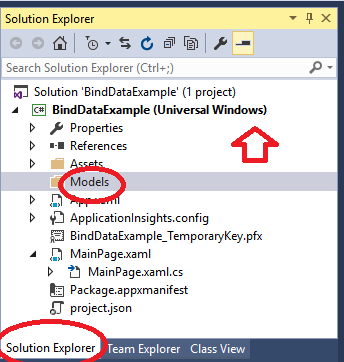 Go to “Solution Explorer” shown by circle. Right click the “BindDataExample” shown by arrow. Add new folder, name it “Models” shown by circle. Right click and select add new item. Select Class and name it “Book.cs“. Once you perform all the above mentioned tasks, there will be a c# class open for us and our object which in this case is a book, we can create its class and define its properties in that very C# class we have. Copy the C# code in red rectangular box. After you created your Book class and set its properties, now its time to create instances of your class and populate it into a collection, list of book. We will generate another class , name it “BookManager” in the same file, for this purpose. And then return the list to caller. The following code will help you out. Our next step is after we created the instances, storing them in collection is to bind the data in GridView from that very class. For this we will return to our “MainPage.xaml” and create a template that how each individual item will appear on the screen. The template code is in red box . 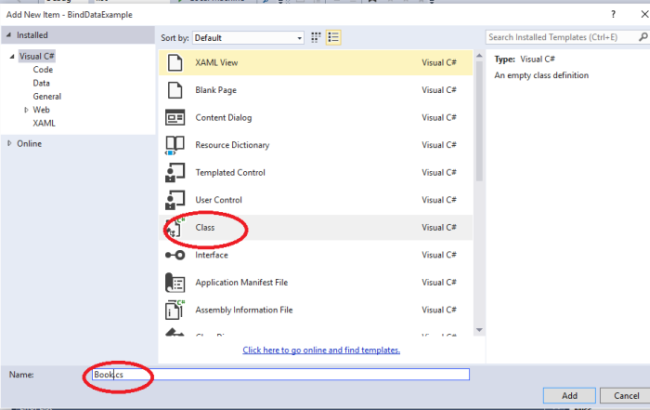 In order to reference the class in XAML, we need to reference its namespace in XAML. Here you go, shown by red arrow. After we create the template, our next step will be to create a public property in “mainpage.xaml.cs “and populate it with Books. Add public property as shown in circular region. 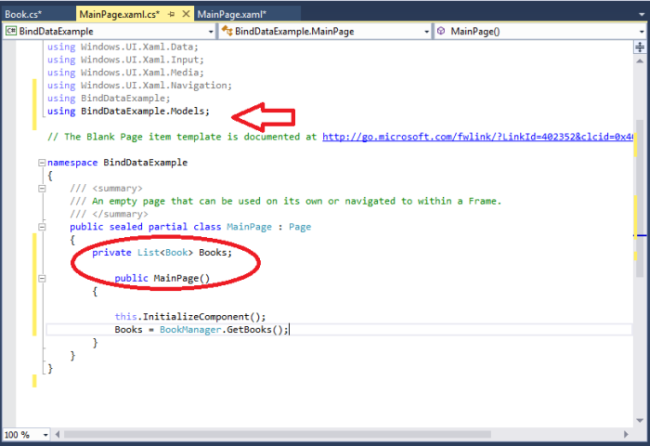 Make sure you add a namespace if it is not there as shown by arrow. Initialize it with “Books=BookManager.GetBooks();.”, this will return list of books. In nutshell, the alignment will make display much better.